Granite countertops are a beautiful addition to any home. Not only do they add a beauty unlike any other, but they’re durable and can last a lifetime. Now, with the increase in homeowners building outdoor kitchens, granite countertops are making their way out of our homes and onto our patios. We, here at Granite Huggers in Sanger, Texas truly appreciate the beauty and utility that granite countertops add to any space. If you’re considering installing granite countertops in your outdoor spaces, there are a few things you should know. Outdoor kitchens are increasing in popularity as more homeowners want to enjoy the outdoors while entertaining their family and guests. While each outdoor kitchen can truly be unique depending on your desires and space, granite countertops add an extra bit of style to your outdoor space. Your outdoor kitchen and entertainment space should be warm and welcoming, much like your indoor kitchen. Homeowners put a lot of thought into what types of appliances and materials they will want to use in this beautiful extension of their home. While selecting the appliances may come easy to some homeowners, others struggle with the materials that they want to use in their outdoor space. Materials must be both durable and resistant to heat, cold, and weather. Granite countertops are one of the more popular ways to go when it comes to countertop materials. Not only do the countertops emit a sense of luxury but they’re very durable and easy to maintain. In fact, granite is one of the best materials that you can select for use in your outdoor space. It is very durable and heat resistant on top of being very easy to clean. If you already have granite in your home, you understand the value that granite countertops provide. Granite countertops are made of natural stone. These beautiful slabs help tie the outdoors into your outdoor space to help your entertaining area flow seamlessly into your surroundings. The convenience of granite’s ability to stand up to extreme temperature changes from below freezing to extreme heat makes it the ultimate choice for outdoor spaces. Due to the wide range of granite options, choosing a granite countertop for your outdoor space allows for ideal customization. Some homeowners choose to select a granite slab that is a similar style as what they already have in their home. This can help tie the outdoor space back into your home and create a beautiful flow and connected feeling throughout. Others may choose a complimentary option that doesn’t necessarily match what’s in their home, but compliments the exterior and interior colors of their home, which can also tie the different areas together. Whichever color scheme you decide to go with, it is important to remember that there are a few tips to consider regarding the granite countertops that will be used in your outdoor space. For outdoor use, granite slabs that have less veining typically do better outdoors when placed in direct sunlight. If your countertop area will be shaded then you can choose the options with more veins, however the epoxies and fillers that are typically used on granite that has heavy veining can be negatively impacted by the sun’s harsh rays. It’s also a good idea to be practical when it comes to your outdoor granite countertops. For example, very dark colors tend to gather and retain heat from the sun’s rays. Granite is no different in this aspect. If your countertops will be in direct sunlight for a good portion of the day then you may want to avoid the darker granite options as they can become extremely hot to the touch. The heat retained from the sun could be enough to burn someone who touches or leans against these dark granite countertops. They could also impact the quality of the food and prep work if you are creating a dish that is better served chilled. Some homeowners choose to mix and match granite throughout their outdoor space. When building an outdoor kitchen and entertainment area, it’s very common for there to be various levels of counter tops. For example, the primary prep space in your outdoor kitchen is typically about 36 inches above the ground. Many people opt to include another granite countertop at 42 inches to be used as a serving area or even a bar area. With so many options available to you, you really can customize your outdoor space to match your style. The resilience of granite countertops will provide you and your family with a luxurious outdoor cooking and dining space for years to come. 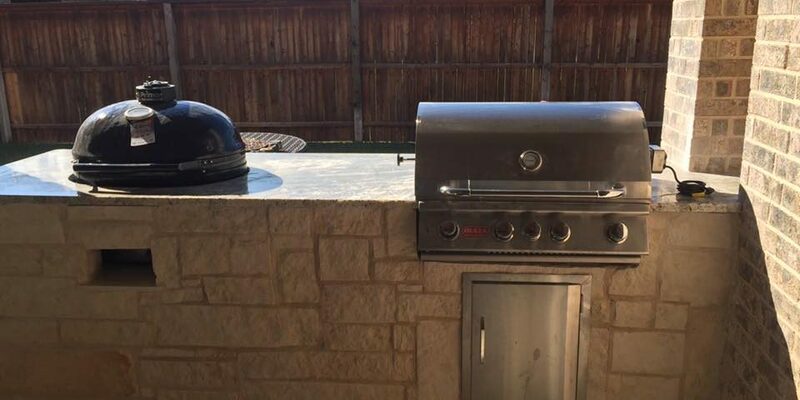 If you have any questions about installing granite countertops in your outdoor space, please contact Granite Huggers in Sanger, Texas at (972) 670-4533.